I’m always looking to publish new, interesting content for my readers here at Fade to Lack, and while my ideal would be to devote a few hours each day to writing something new and insightful about the worlds of film and television, the truth of the matter is I just don’t have the same amount of time I used to, back in High School or my early College days when I would routinely publish a review or article every, or nearly every, day. The blog has certainly returned to having a healthy amount of content, after the dry spell that resulted from my stint over at We Got This Covered, and I’m glad that every week, Fade to Lack at least has one or more movie reviews, a television analysis piece (currently Mad Men), and a new installment of The Weekly Stuff Podcast with Jonathan Lack and Sean Chapman. All of it is material I’m very proud of, and have a tremendous amount of fun creating, but I’d like for there to be more, and now that summer is drawing near, I have a lot of plans for adding more content in the form of additional columns, one-off features, and more. 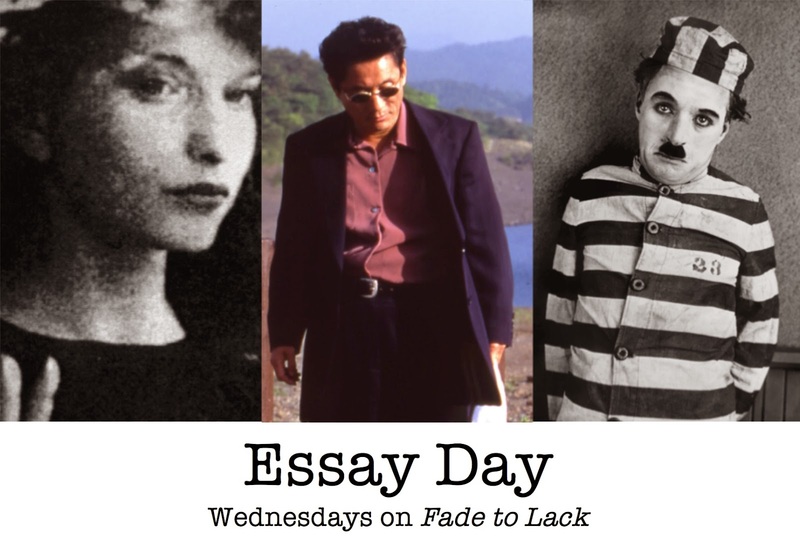 That initiative starts today with a brand new series titled “Essay Day,” which will be publishing every Wednesday at least through the end of the summer. Since most of my recent time crunch has come from educational commitments as a film student at the University of Colorado at Boulder, I thought it might be fun to share with my readers some of the work I have been doing there these past few years – which, of course, includes a number of essays and scholarly papers that I am very proud of, and have yet to share with my audience here at Fade to Lack. A few of them have trickled out onto this blog over the years, but never in the form of a consistent, readily organized series, and I am extremely excited to share all this work with you. What will these essays look like? There is actually a lot of variety to them, even though almost all were written for film studies classes and deal with film-specific issues. Some are close textual analysis, while others are more aesthetic-oriented studies; some are auteur surveys, and a few are less traditional comparisons between movies and other artistic mediums. They are almost uniformly longer than anything I usually publish here, but they will be presented more or less unedited, and I’ll take some time at the beginning of each installment to explain the essay’s background. Over the course of this series, we will be exploring many different avenues of film, from classical Hollywood to avant-garde filmmaking to documentary to international cinema, with directors such as Charlie Chaplin, Maya Deren, Takeshi Kitano, Kenji Mizoguchi, and several others represented. One of these essays is even about James Bond – every week will offer something substantially different from the last, which is part of why I was so excited to put this series together. It all begins next week, with an essay on the ethics of Charlie Chaplin – featuring both a full written essay and a fancy video version – and will, as previously noted, continue every Wednesday throughout the summer. It’s only one of the new features I have planned for the summer months – this June will mark the tenth anniversary of my first official ‘film critic’ gig, so I have a lot of special material planned for then – and I sincerely hope you enjoy the work. Follow Jonathan Lack on Twitter for updates on all Fade to Lack content! This is a nice information here in this blog I like it. This is a nice stuff for the sharing keep it up. Understanding the main topic of the essay permits you to concentration your time and efforts. It is possible to dip write essay by yourself to locate away just about all there may be to know in regards to specific subject matter with no probability of obtaining distracted.